I left my journalism career in 2010 to return to my first love, filmmaking. In 2011, I wrote and directed my first feature, HAND OF GLORY, for a budget of less than $5,000. We received critical acclaim and awards including Best Actress and Best Director, and we're proud of this little gem. By 2013, I'd completed my first documentary, THE AX MAN ENIGMA, which explored a series of hundred-year-old unsolved slayings, including the infamous Villisca Axe Murders. The film went on to win awards for Best Film, Best Editing, Best Cinematography and Best Sound. Based on the real-life unsolved mystery behind The Ax Man Enigma, I completed the screenplay for SLAY UTTERLY in in 2013. The script went on to win Best Feature in a screenwriting competition, and wowed genre actors including Zach Galligan, Bill Oberst Jr., Lynn Lowry and Melantha Blackthorne, who jumped aboard the project. And while the film has not yet been financed, we're confident it'll get made, come hell or high water. Also in 2013, I had the pleasure of serving as Director of Photography for a delightful little film called HOUSE OF THE DEGENERATE BRAIN-EATING MUTANT FOG INSECTS, which was part of a trilogy tipping the hat to the works of Ed Wood. 2013 was a busy year for me, as it also included a short film for a 48-hour film competition. The short was called Mictlantecuhtli, named for the Aztec god. And while the constraints of a 48-hour script-to-completion proved less than desirable, the film proved to be a jumping-off point for the development of an H.P. Lovecraft-inspired web series. Several attempts were made to raise funds for the series, and we started shooting the first episode, only to finally abandon the project in 2017. But in the world of Lovecraft, is anything really dead. Later in 2017, I was contacted by a YouTube channel I'd forgotten I'd pitched the series to. They sent us a modest budget to shoot a pilot. Though ours fared better than the other pilots of the season, the channel ultimately decided against green-lighting THE MISKATONIC FILES as a series. The plan now is to submit the pilot to specialty festivals with the hope of stirring up additional support for turning this into a series. In 2014, I tried my hand once more at a 48-hour film competition, The result this time was TISSUE, a short that followed an alcoholic writer through a particularly troublesome day. 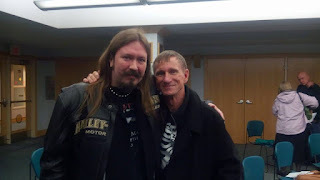 The film earned me The Bukowski Award at a respected, long-running Chicago film festival, as well as other awards, including Best Director and Best Writer at others. As I continued trying to develop Slay Utterly and The Miskatonic Files in the meantime, 2015 proved to be a year I had nothing to show for, in terms of completed films. Determined not to let 2016 end in the same manner, I was asked to write and direct a short film for yet another 48-hour competition. What a delight it was to work with so many competent professionals! 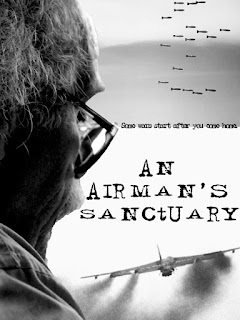 The result was AN AIRMAN'S SANCTUARY, which went on to win Best Director and runner-up for Best Film. Stay tuned for exciting news about projects coming in 2018!